I was hosted for a night at Knott’s Scary Farm in exchange for this post. All opinions are my own. Let’s talk about Knott’s Scary Farm. Have you ever been before to this extremely popular & terrifying event here in Southern California? ? It’s so scary and also so much fun! This year, Knott’s Scary Farm’s lineup includes 9 terrifying mazes to take on,, special shows and frightening experiences just for Knott’s Scary Farm nights, 100s of roaming monsters and ghosts roaming the streets of Ghost Town and the other Scare Zones plus tons of attractions to ride. There’s a lot to tackle between the hours of 7pm and 2am (It closes at 1am on some nights.) 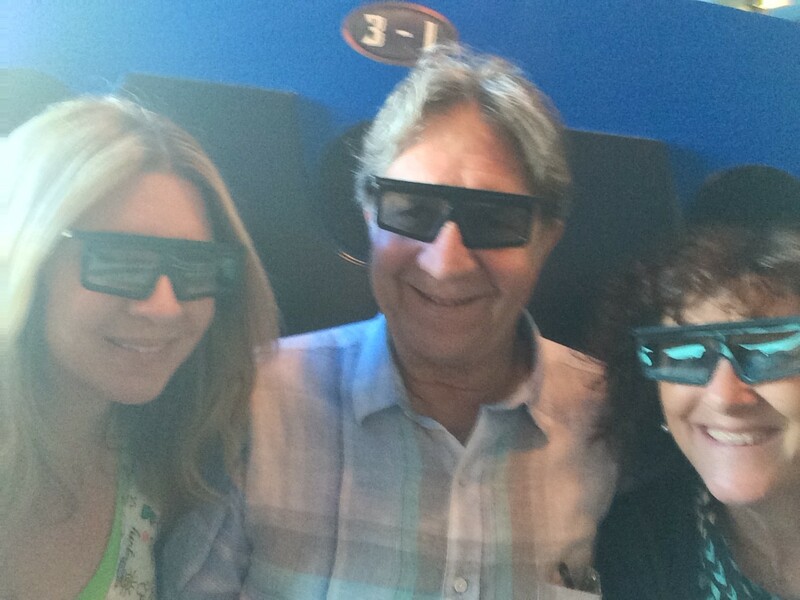 We had the opportunity to experience Knott’s Scary Farm in a whole new way: with a Fright & Fast Lane Pass! It was a game-changer and that’s no exaggeration! Some nights at Knott’s Scary Farm draw pretty large crowds, especially as it gets closer to Halloween. The Fast & Fright Lane add-on option is available for guests to upgrade their regular Knott’s Scary Farm ticket .I would highly recommend adding on Fright & Fast Lane to your Knott’s Scary Farm ticket because it definitely helps you make the most of your night. What is a Fright & Fast Lane Pass? This special pass, available as an add-on to your Knott’s Scary Farm ticket (see pricing HERE) grants you unlimited priority access to all 9 mazes and unlimited priority boarding to the 13 regular Fast Lane attractions. It’s good for a single night at Knott’s Scary Farm and totally worth it! How does Fright & Fast Lane work? 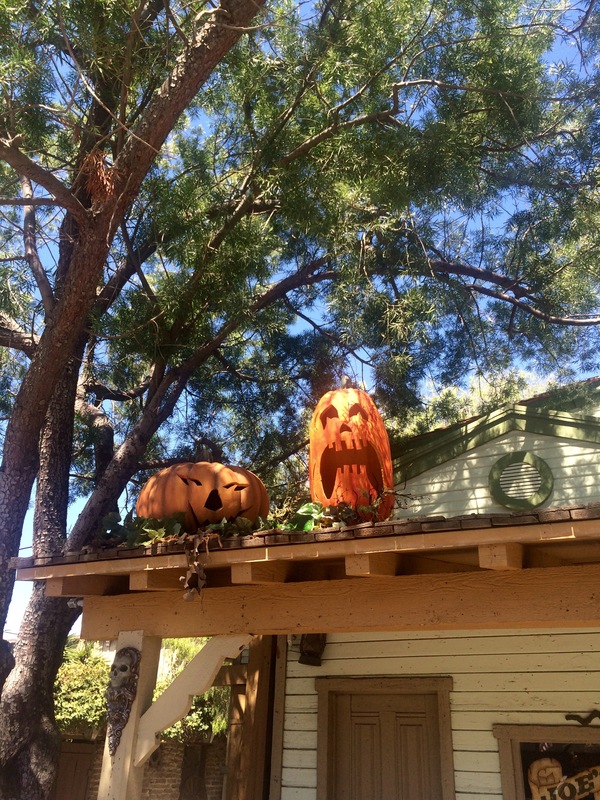 The best way to purchase a Fright & Fast Lane pass is beforehand and online. After you purchase it, you print out the confirmation and bring it with you to the Park where you’ll exchange it for a wristband at Guest Relations. The wristband must be kept on the entire night and you’ll be asked to show it at the entrance to each maze and/or attraction you wish priority access to. Each member in your party must purchase their own Fright & Fast lane wristband in order to gain the priority entry to mazes and attractions. Is Fright & Fast Lane worth it? Did you know that Knott’s offers packages that include your Knott’s Scary Farm ticket and a Fright & Fast Lane wristband? For information about it, please go HERE. Also, don’t forget to purchase your Knott’s Scary Farm parking online (beforehand) HERE to save money on it. Guests can also book a hotel package at Knott’s Berry Farm Hotel, which is adjacent to the park. More information about hotel packages can be found HERE. We had a blast checking out Knott’s Scary Farm this year and having the opportunity to take our daughter for her first experience. It’s recommended for guests 13 years and older. In my opinion, there are some 13 year olds who can handle it but there also may be some who are not yet ready. Some of the stuff you see and experience is really scary so just take that into consideration when deciding if it’s right for your own child. Knott’s Scary Farm Tip #1: Arrive early and they’ll let you into the front of the Park before 7pm. Then you can take some photos before all of the madness starts! Look for the cute backdrops right at the entrance. FunPix photographers are also on-hand taking pics. FunPix which is something you can add-on to your experience and have access to all of your event and ride photos. Knott’s Scary Farm Tip #2: Dress for the weather. Since this event is held at night, dress accordingly. Also, remember your feet. If you wear comfy, closed toe shoes, your feet will thank you. Knott’s Scary Farm even happens in the rain so be sure to bring a sweatshirt or jacket with you in case it rains. Also, the shops sell plastic ponchos if it does start raining. 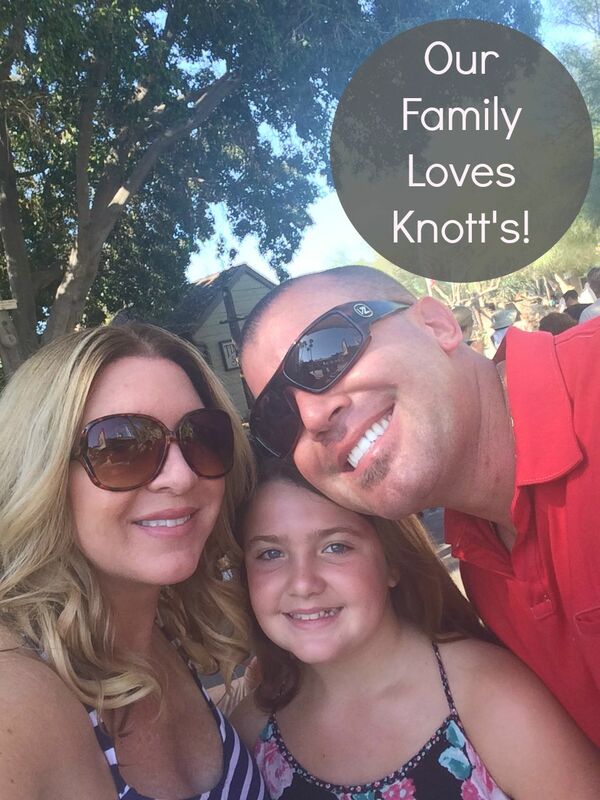 A very special THANK YOU to Knott’s for hosting our family at Knott’s Scary Farm. It was such a fun night taking our daughter for her first time and we can’t wait to return again! 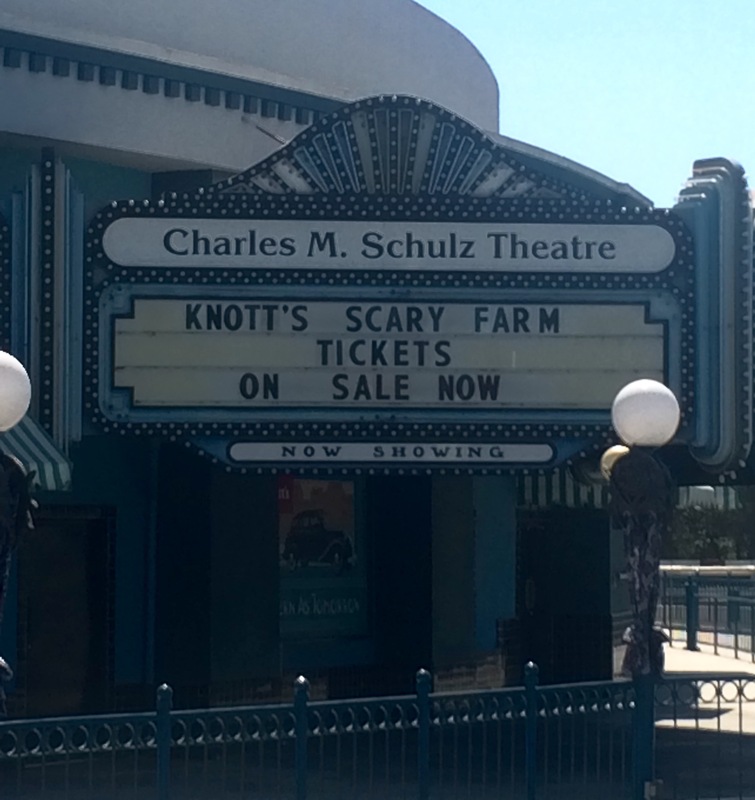 For more information about Knott’s Scary Farm, go HERE. Some images and graphics are property of Knott’s and used with permission. negative-g stall loop, which gives riders the sensation of floating. “HangTime’s disappearing track creates a memorable illusion of the unknown as riders feel like they are hanging over a cliff, staring at the ground in nervous anticipation. People who crave that adrenaline rush will want to ride this coaster again and again. Introducing a coaster like HangTime firmly positions Knott’s Berry Farm as a must see attraction among Southern California theme parks, and we look forward to welcoming our guests to this new experience.” Jon Storbeck, vice president and general manager, Knott’s Berry Farm. colorful nighttime track chase lighting that will accompany the coaster train’s travels across the smooth steel track. The coaster continues Knott’s legacy in rollercoaster innovation and industry firsts; the park introduced the very first corkscrew inversion rollercoaster with Corkscrew, and the first flywheel launch coaster with Montezuma’s Revenge. HangTime is manufactured by Gerstlauer Amusement Rides, GmbH, and is the company’s next generation “infinity coaster” model. Guests can experience an entire season of fun including the thrill of HangTime with a 2018 Knott’s Season Pass, on sale now at the best price of the year. A Regular Season Pass includes unlimited admission in 2018 to Knott’s Berry Farm with no blackout dates, and a Gold Season Pass includes unlimited admission in 2018 to both Knott’s Berry Farm and the newly expanded Knott’s Soak City Waterpark with no blackout dates. Regular passes are just $92 or nine easy payments of $10.22 and Gold Season Passes are $110 or nine payments of just $12.22. These offers end October 29, 2017. Applicable taxes and fees apply online. Payment plans are only available at knotts.com. For more information about HangTime, Knott’s Berry Farm and Knott’s Season Passes, please visit knotts.com. Join the conversation about HangTime dive coaster using #KnottsHangTime and #KnottsBerryFarm. I was invited as a guest of Knott’s Berry Farm to a day in the Park in order to write this review. All opinions are 100% my own. If you’ve been following along on my Instagram lately, you may have notice a few of the delicious pictures I posted from Knott’s Boysenberry Festival. I had the opportunity to spend a day in the Park, enjoying many of their boysenberry-inspired foods and drinks. I got so excited to see Ghost Town all decked out for the occasion! 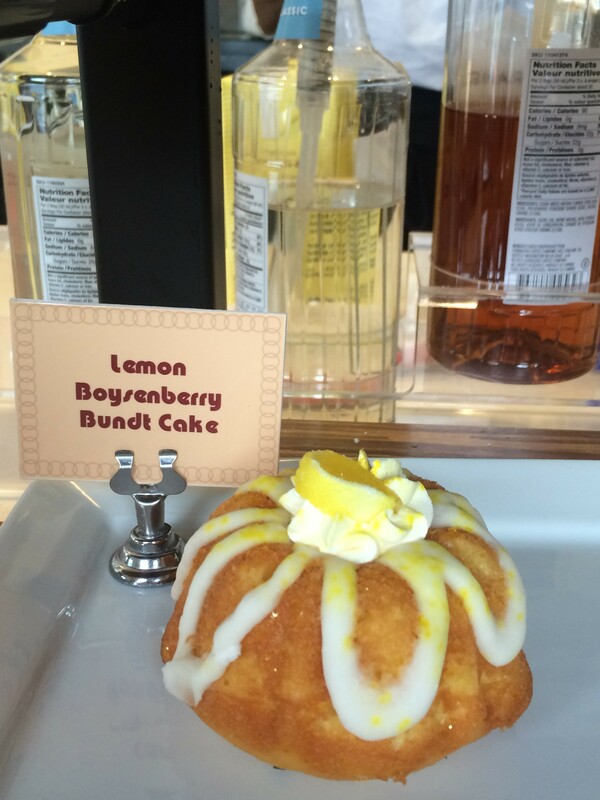 Did you know that the boysenberry originated at Knott’s? Yep! The roots of Knott’s Berry Farm stretch back to the early 1930s when Walter Knott nurtured the only surviving boysenberry vines back to health and began selling the berries from his fruit stand on Beach Blvd. in Buena Park, California. The popular purple little boysenberry put Knott’s Berry Farm on the road to being America’s first theme park. The rest, as they say, is history. As the birthplace of the delectable boysenberry Knott’s Berry Farm. 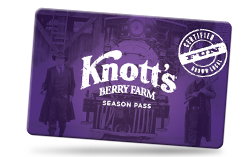 Knott’s Boysenberry Festival runs from April 1-23 this year. During the festival, guests have the opportunity to enjoy boysenberry foods, both sweet and savory, and boysenberry-inspired craft beer and wine. Trust me when I say that you need to try all of the special boysenberry offerings during Knott;s Boysenberry Festival. One of the best ways to get a tasting of a variety of these foods is by purchasing a Festival Tasting Card. For just $25, you’ll get to sample 6 different items. As you can see, I started with one of the desserts, Boysenberry Panna Cotta! The Festival Tasting Card gives you quite a bit of food as you get samples of Boysenberry BBQ Meatballs, Boysenberry Fry Bread, Boysenberry Buffalo Wings, Boysenberry Ravioli, Boysenberry Panna Cotta, and Boysenberry Pizza! Many of the special Knott’s brand jams, jellies, sauces, candies, and other boysenberry products are available year-round inside the park in General Store (located in Ghost Town) and outside the park at Berry Market (located in the California MarketPlace), as well as online. This is such great news for someone like me who is obsessed with all things boysenberry. Aside from all of the boysenberry goodness at Knott’s Boysenberry Festival, there’s also a great lineup of entertainment for the whole family, you won’t want to miss including Snoopy’s Boysenberry Jamboree (on the Calico Mine Stage), Old Time Melodrama (Bird Cage Theater), The History of Boysenberry & Knott’s Berry Farm (in Town Hall), Cloud 9 Ballroom/Studio K Classic Dance Party (in the Boardwalk Ballroom), Wild West Stunt Show: Frontier Feats of Wonder! (in Wagon Camp Theater), and the fun Camptivities (in Camp Snoopy). Also stop by Calico Park for some fun, music & games and visit the animals Old MacDonald’s Farm (in Ghost Town). Knott’s Boysenberry Festival is a must-do. Be sure to stop by before April 23rd! For more information, visit Knott’s Berry Farm’s site here. Some images and logo are property of Knott’s. We recently enjoyed a “Sunday Funday” at Knott’s Berry Farm and were there from park opening to park closing. There’s just so much to see and do there, especially right now during their 75th Anniversary Celebration of Ghost Town. Have you been yet? If you haven’t, you must make it there before September 5, when it all ends. When you spend that long in the park, you’re going to eat more than one meal there. 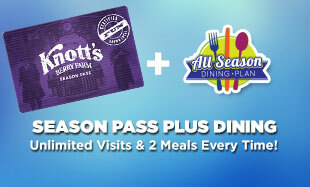 Did you know that Knott’s offers an All Day Dining Plan? It’s a great deal because for only $31.99 per person, you can enjoy one select entree and one side (drink not included) from any of the participating dining locations in the Park. The easiest way to add the All Day Dining Plan is to purchase yours online, before your visit. After you purchase the option online, you print out your voucher and take it to one of the participating dining locations, where you’ll receive a wristband. During operating hours, the wristband entitles you to dine every 90 minutes if you desire. Wouldn’t it be fun to spend an entire day at Knott’s, just eating every 90 minutes? Ok, I’m just joking. The All Day Dining Plan doesn’t include drinks but I need to share one of the best drink deals in the Park with you! You can purchase a 2016 Souvenir Bottle for only $14.99 and get free drink refills the entire day! It’s a great deal and we used it in between meals to carry around ice water, which they’d also refill for us. It’s almost always hot outside in Southern California so having the option to get a cold, icy drink constantly refilled was a life-saver. Also, if you purchase it online before your visit, it’s only $10.99! For more information about Knott’s All Day Dining Plan or general park information, go here. 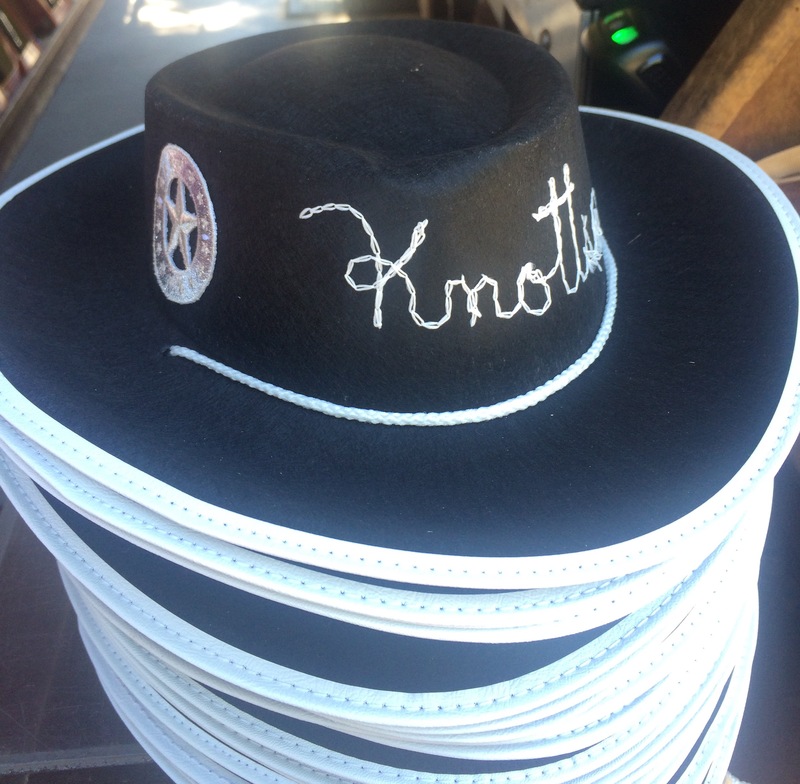 Connect with Knott’s on Facebook, Twitter, and Instagram. This is not a sponsored post. I was invited to visit Knott’s and received media tickets in order to facilitate this review. All opinions are 100% my own. The opinions in this article are my own. I do not work for, or with, any brand mentioned in this article, nor do I have any official relationship with them. I have a relationship with GigaSavvy, for whom I create original editorial content, All opinions are 100% my own. Some images and logos are property of Knott’s Berry Farm. . 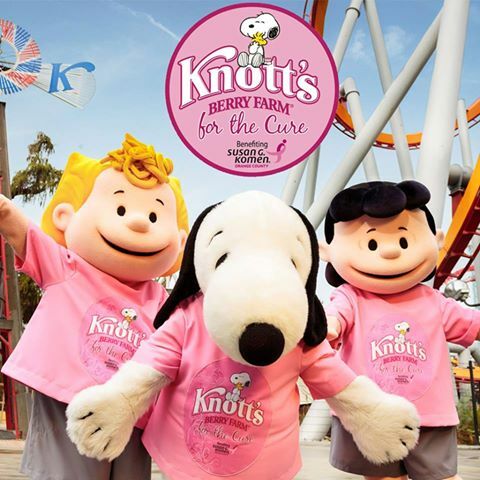 If you haven’t heard already, Knott’s Berry Farm and Susan G. Komen Orange County are partnering up again, for a third year, to raise money for breast cancer awareness during “Knott’s For The Cure”! The partnership, which began in 2013, will once again align two prominent organizations in raising awareness and vital funds for local breast health and breast cancer services for women and men. 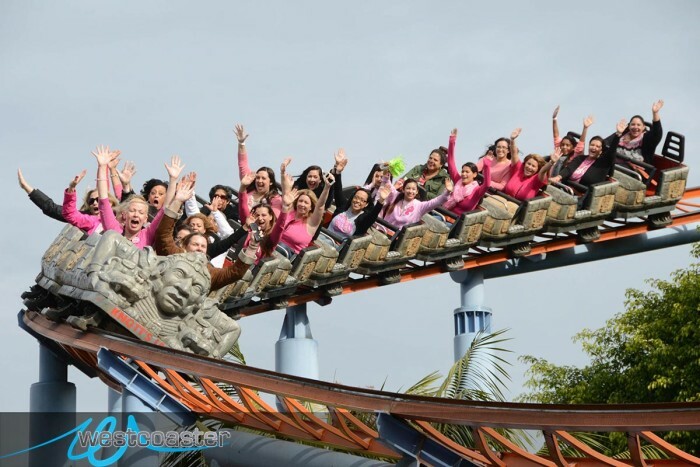 In 2014 and 2015, the theme park helped raise $230k for Susan G. Komen Orange County! Funding for free mammograms for uninsured and underserved women via the Knott’s sponsored Alinea mobile mammography van. I had the honor of being invited to attend the kickoff for their partnership last year and got to hear my dear friend, Jaime, speak about her own breast cancer story! I got to spend an inspirational morning with Jaime and a huge group of breast cancer survivors. I even got to participate in their victory ride on “Jaguar”. Breast cancer patients and survivors are some of the strongest people you’ll ever meet! From January 4 through March 18, Knott’s is offering a special “Pink Ticket”, a limited edition “Pink” t-shirt, and other special “Pink” merchandise for purchase, with proceeds going to Susan G. Komen Orange County. The 2016 campaign will focus on the promise that Komen founder Nancy G. Brinker made to her dying sister, Susan G. Komen: that she would do everything in her power to end breast cancer forever. Special rides and landmarks inside of the theme park will glow pink in honor of the promotion. Knott’s Berry Farm and Susan G. Komen Orange County invite guests to share their “for the cure” promises during the charitable promotion at knotts.com/promise and join in on the conversation on their social media platforms using #KnottsPink. Knott’s is committed to helping Susan G. Komen get one step closer to a world without breast cancer. Won’t you help too by joining in and showing your own support by purchasing a “Pink Ticket” and visiting the park during the promotion? Click here to purchase your ticket online for only $40! That’s a $32 discount for buying it in advance and online! What an amazing deal for an entire day of fun in the park! Come out to Knott’s Berry Farm For the Cure! 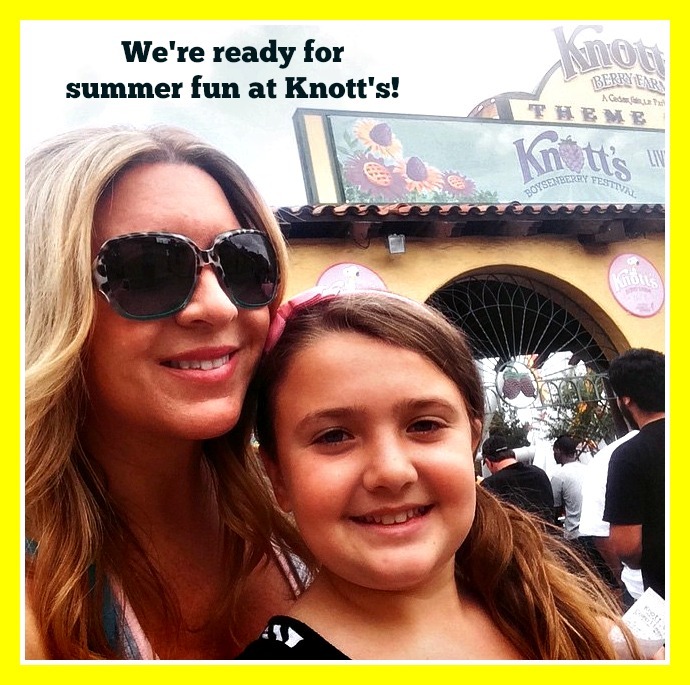 I’m also giving away a pair of tickets to Knott’s for one of my lucky readers! All you have to do is enter below in the Raffecopter! Be sure to read the instructions carefully! Good luck everyone! It’s that time again! 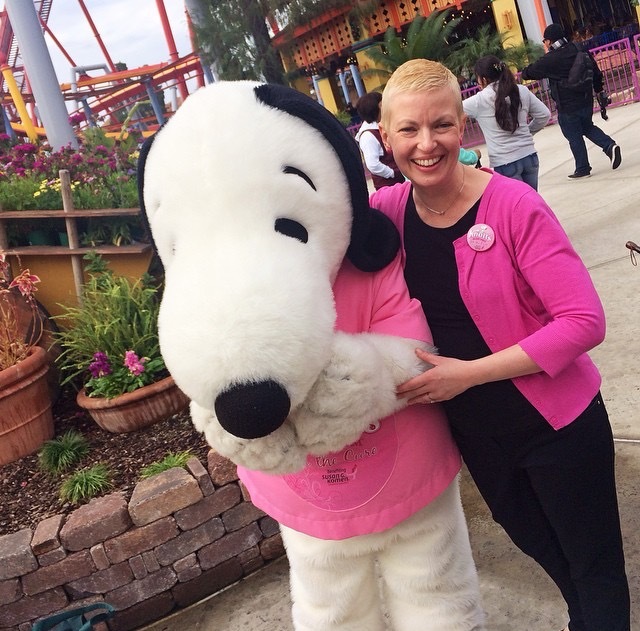 Right now, you can help Susan G. Komen Orange County when you purchase a Knott’s “Pink Ticket” to get into the park! 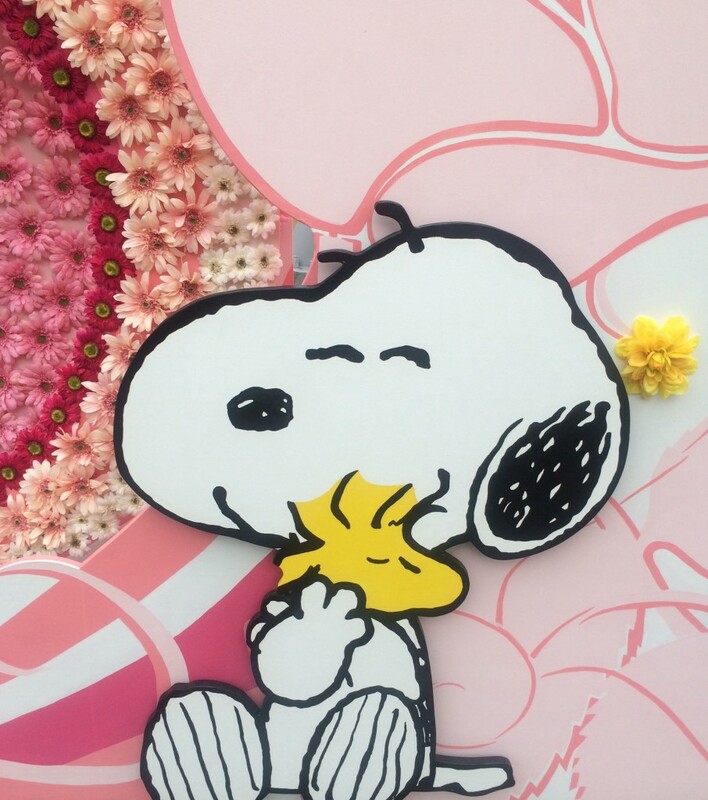 Just by purchasing one of these special edition tickets, Knott’s will donate a portion of your ticket purchase to benefit Susan G. Komen and breast cancer research. Also, if you purchase your tickets online ahead of time, you’ll save $32 per ticket off the front gate price of $72. 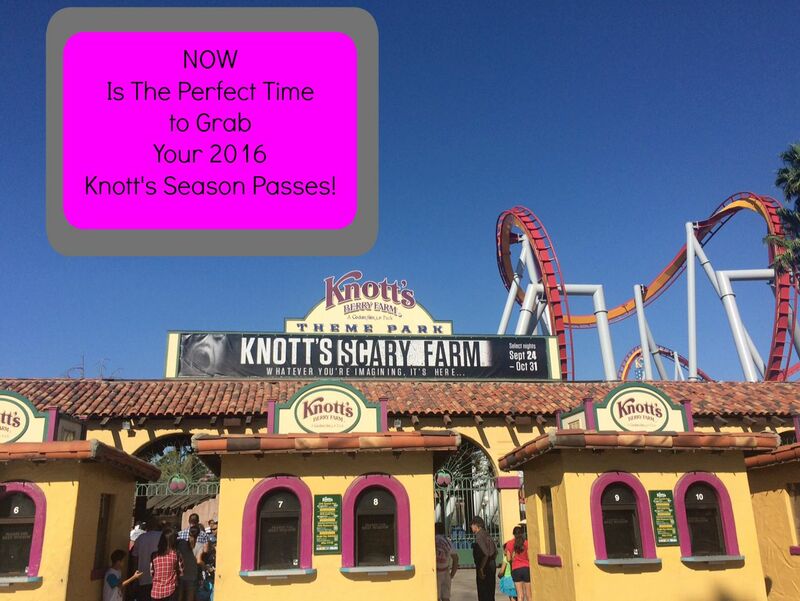 That means you can purchase a Knott’s Pink Ticket for only $40 online! Admission tickets are valid for one day admission on any day through April 1, 2016. Valid for ages 12-61. To purchase yours online, go here. Connect with Knott’s Berry Farm on Facebook, Twitter. and Instagram, too! This is not a sponsored post. All opinions are 100% my own. Images are property of Knott’s. Disclosure: The opinions in this article are 100% my own. I do not work for, or with, any brand mentioned in this article, nor do I have any official relationship with them. I have a relationship with GigaSavvy, for whom I create original editorial content. 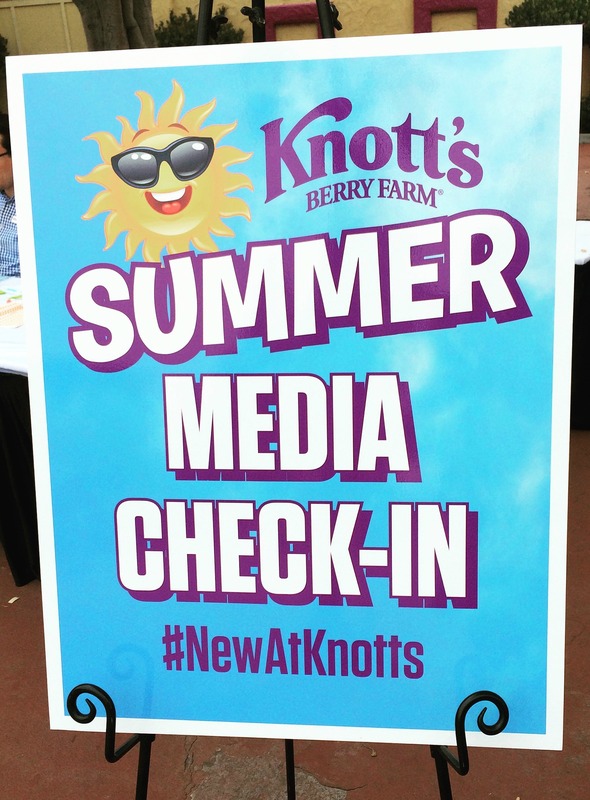 After reading about all of the new things at Knott’s this summer, I was beyond excited to be attending their Summer Media Day to kick of my summer. I could barely sleep past 5 a.m. that morning! As I sipped my morning coffee in my favorite Peanuts mug, I put together a list of things I wanted to accomplish that day. 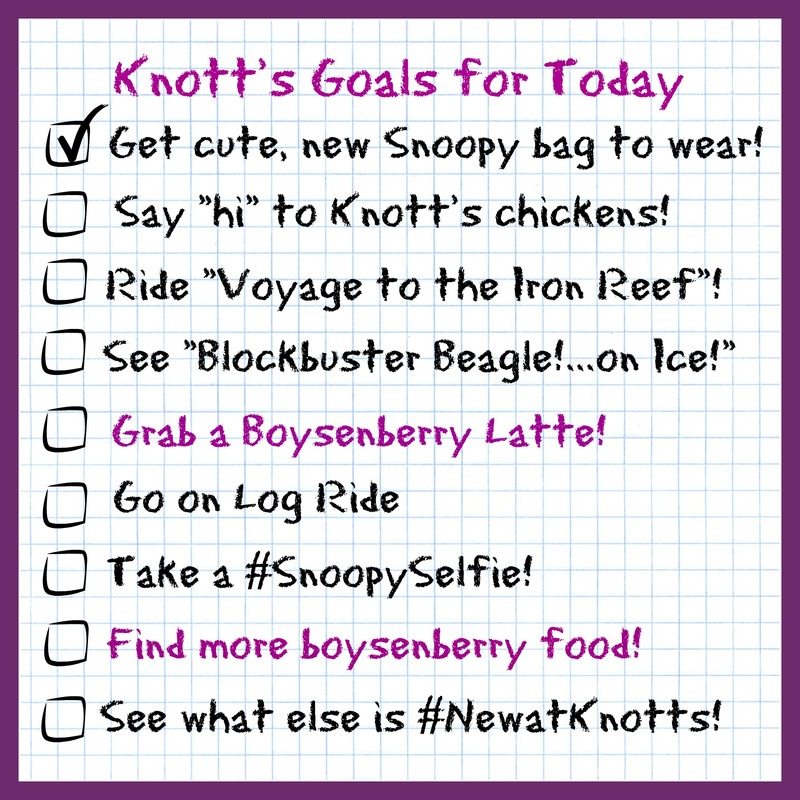 I think it’s good to set goals, even if they are “Knott’s Goals”, right? 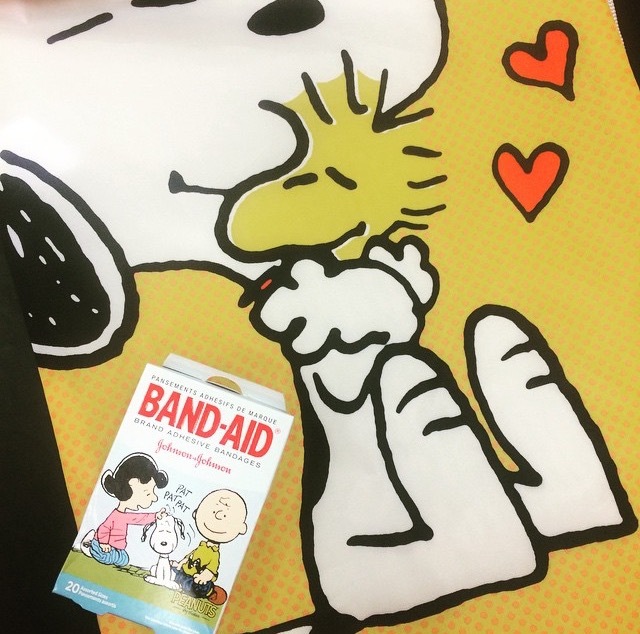 With my need to be matchy-matchy all the time and deep love for the Peanuts gang, I had already purchased the cutest little Snoopy knapsack the day before, along with a box of Peanuts bandages. So, I proceeded to pack new my knapsack full of park necessities because I was planning for a marathon of a day. Yeah, I’m a planner AND a packer! One of the most special parts about this particular visit to Knott’s was that I got to spend the day with my dad. 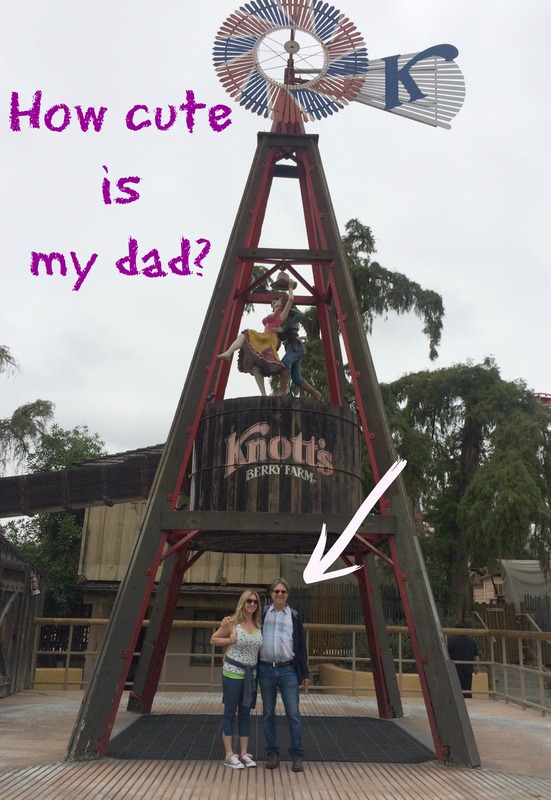 I hadn’t been to Knott’s with my dad since I was a little girl! We used to visit every summer and he was the one that took me on my first upside-down rollercoaster there, “Corkscrew”! It’s not there any more but Knott’s holds a special place in my heart and that’s one of the reasons. My dad knew JUST what I needed when we got through Calico Ghost Town….a grande, nonfat, boysenberry latte WITH whipped cream! Knott’s serves Starbucks. 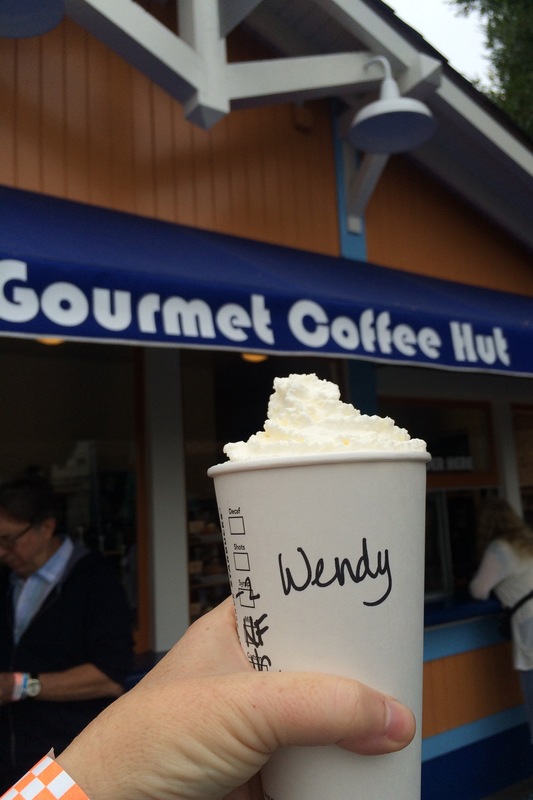 This particular flavor of drink is exclusive to Knott’s and you can grab one of our own at the Gourmet Coffee Hut. In addition to their extensive drink menu, you can also choose from a variety of yummy pastries! 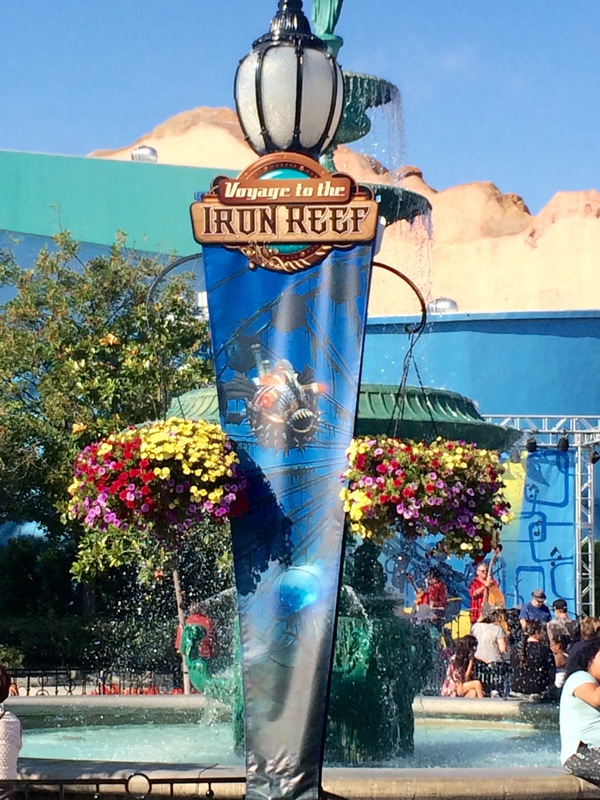 After enjoying our Starbucks, we were ready to take on the latest attraction to open at Knott’s: Voyage to the Iron Reef! This brand new attraction opened on May 15 and I was dying to go on it since I’d heard it’s really cool. 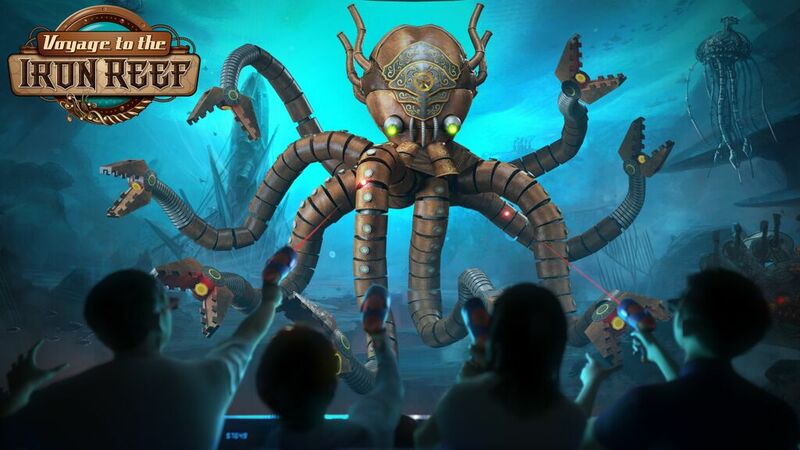 Voyage to the Iron Reef is a 4-D interactive adventure that has you taking on The Kraken Queen and her aquatic army, all while wearing 3-D glasses and going head-to-head with your friends for the highest score! 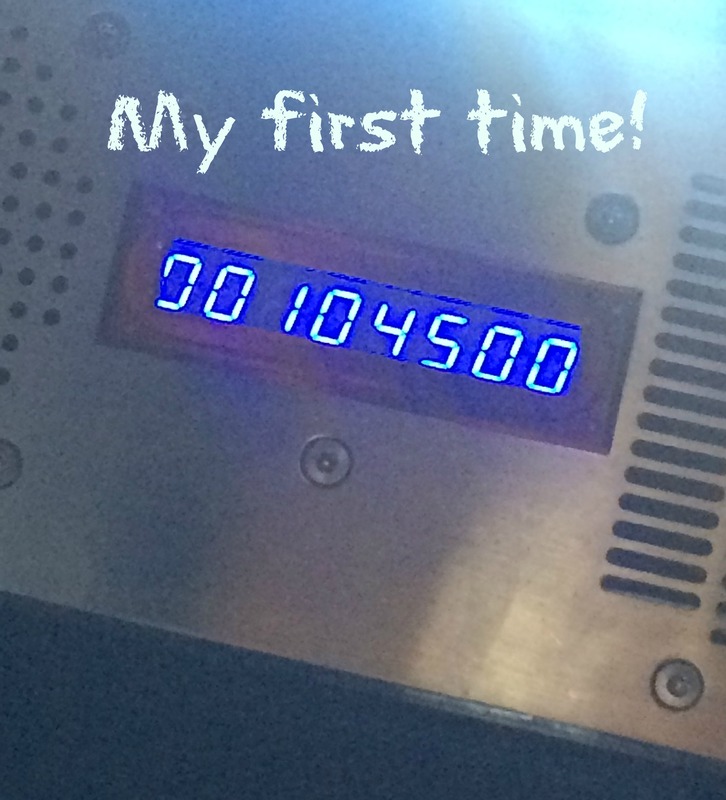 It was a REALLY cool experience and we kept getting back into line because we were on a quest to beat our previous high scores. When you exit, you can see your scores. I don’t mean to brag but check out my score from my first time! 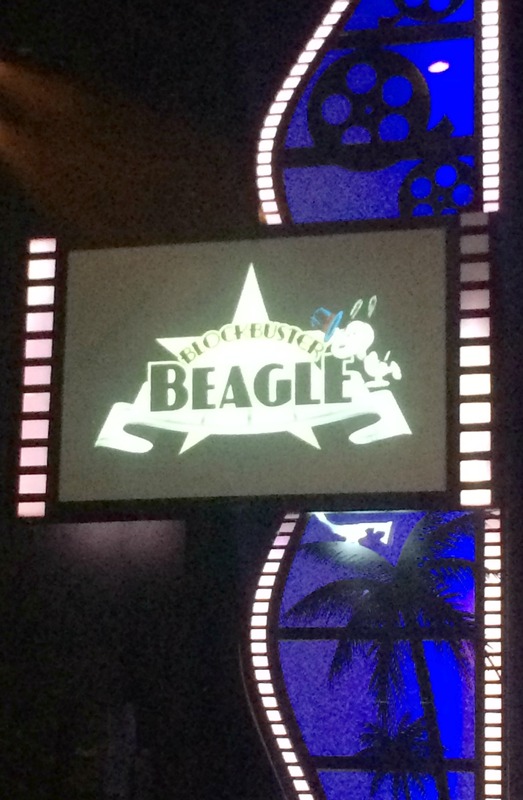 Next, we were ready to preview the all-new Blockbuster Beagle…on Ice! 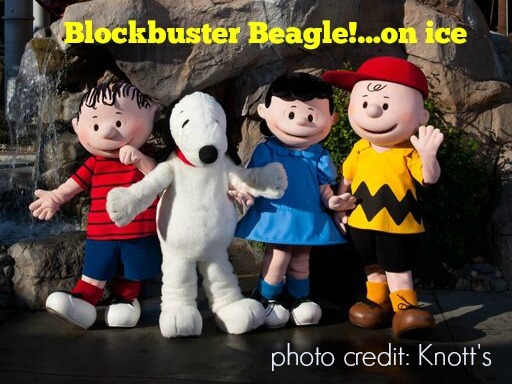 What a treat, considering I usually only see Snoopy on Ice shows during Knott’s Merry Farm! 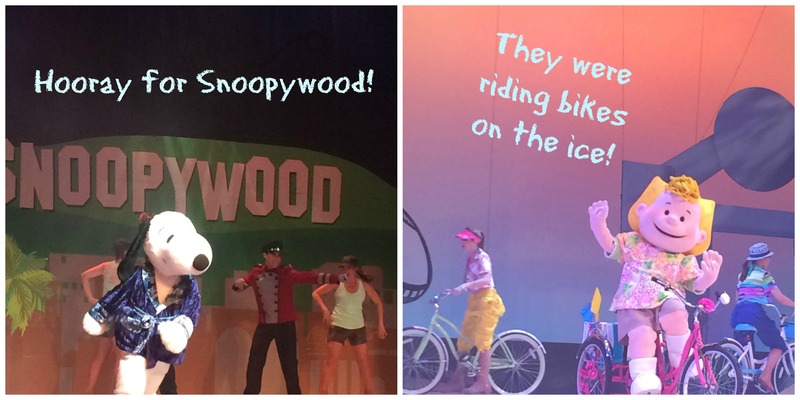 If you’ve never seen any of the Snoopy on Ice shows in the Charles M. Schultz Theatre, not only are they adorable, but the skaters are incredibly talented! 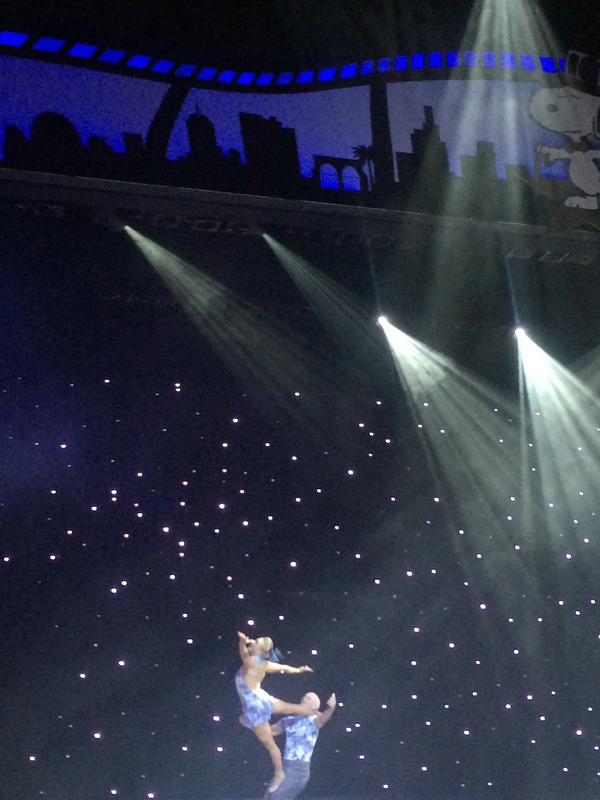 In this new production, Snoopy and his Peanuts buddies “go Hollywood“, bringing Walk of Fame glamour, dazzling movie lot escapades, and California excitement to a brand new ice show adventure. I enjoyed the show immensely. The music is so good and there is so much going on the entire time. I need to go back to watch it a couple more times because it’s just that good! This is where a Knott’s Season Pass comes in handy! With this much stuff to see and do at Knott’s. you can keep going back when you have a Season Pass because there are no blockout dates. 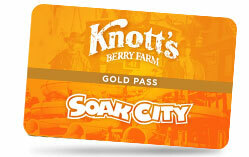 With Knott’s Soak City open, a Gold Pass is even more ideal. Unlimited visits to Knott’s AND entry to Soak City? Yes, please! 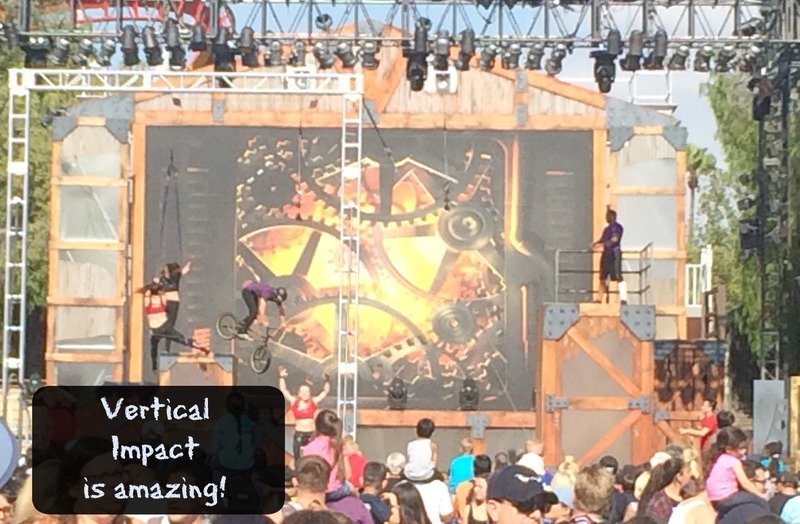 Another cool show I got to watch for the first time was Vertical Impact! I squeezed myself into the middle of the anxious crowd in Calico Square, who were all waiting to watch this ultimate blend of extreme stunts with high flying acrobats performing a one-of-a-kind performance. 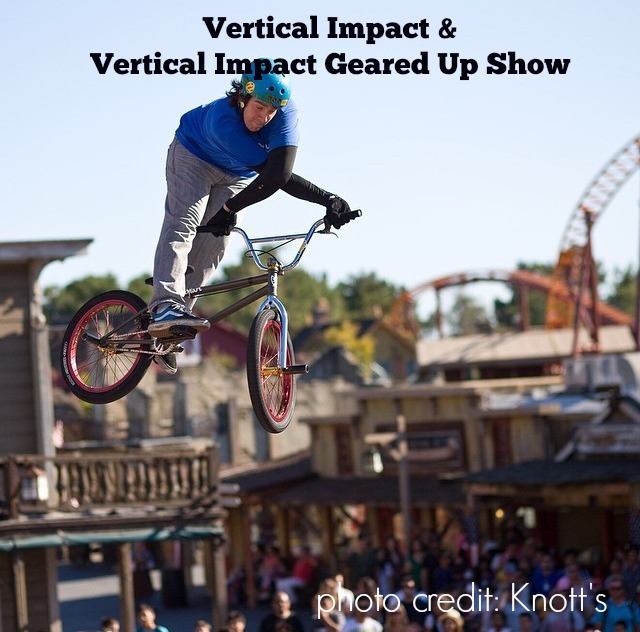 This high energy show is set to the most popular songs of today, combining everything from trampoline stunts, BMX, skaters, dancers, and aerialists. I think my mouth kept dropping open watching the amazing performers! 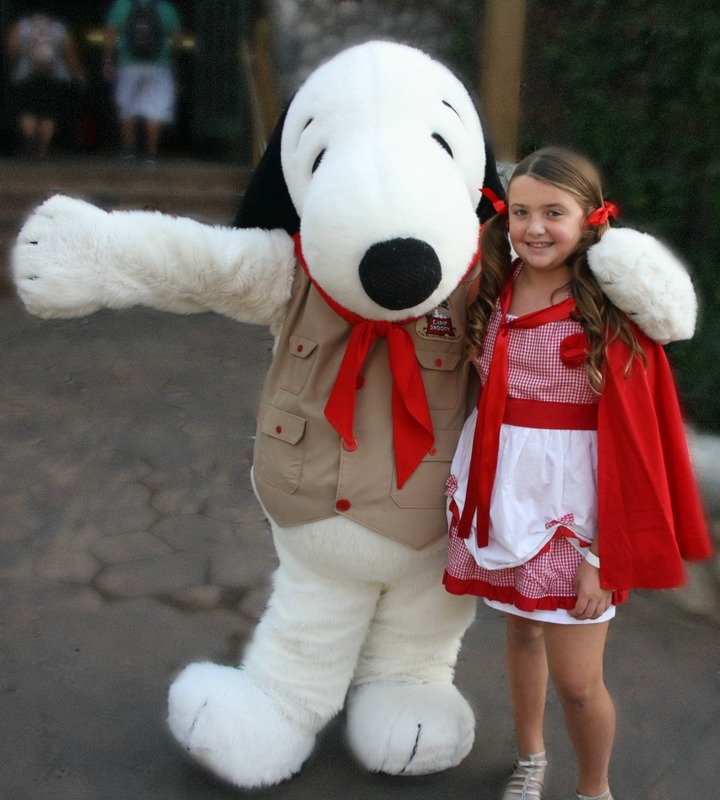 There are so many things to do at Knott’s this summer! Fun on all of the rides, yummy food to eat, and TONS of shows to see, too! 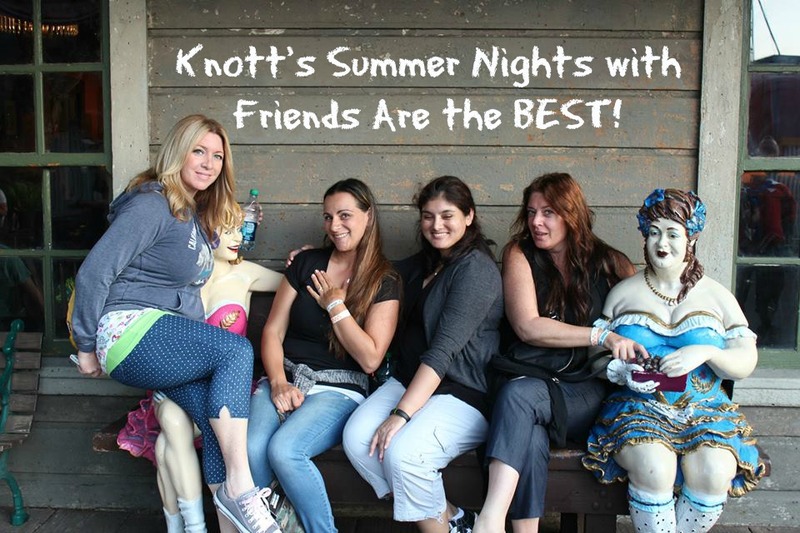 Summer nights at Knott’s are one of my favorite parts about summer, especially when they’re spent with friends! 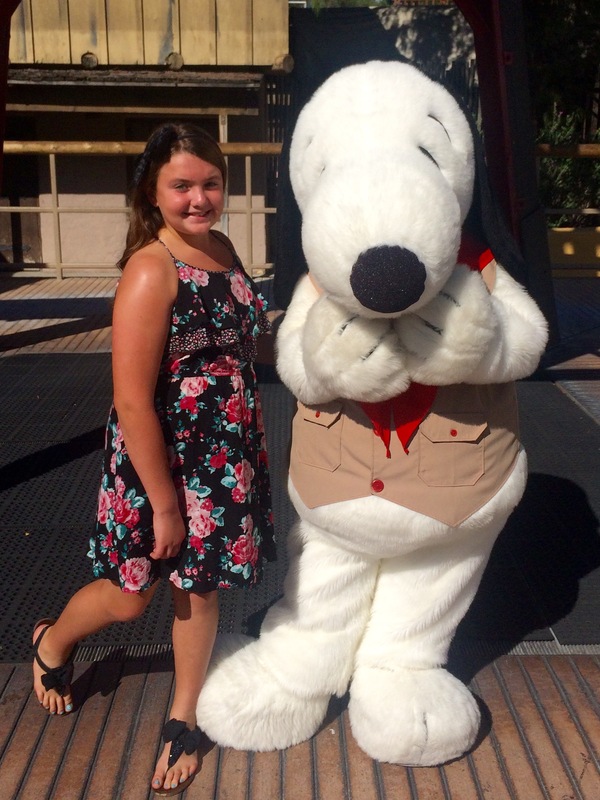 What’s YOUR favorite thing to do at Knott’s in the summer?